Police claim they had grounds to u2018reasonably suspectu2019 that a photographer was a terrorist when they stopped and searched him in Trafalgar Square last week. Police claim they had grounds to ?reasonably suspect? 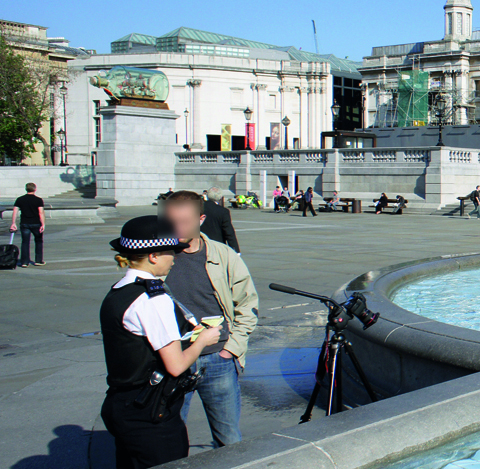 that a photographer was a terrorist when they stopped and searched him in Trafalgar Square last week. By law, police should only stop and search a person under Section 43 of the Terrorism Act if they ?reasonably suspect? the person to be a terrorist. Section 43 states: ?A constable may stop and search a person whom he reasonable suspects to be a terrorist to discover whether he has in his possession anything which may constitute evidence that he is a terrorist.? Following repeated enquires made by Amateur Photographer (AP) over the past week, the Metropolitan Police have finally tracked down the officer and issued a statement. In the statement, released to AP today, a Met spokeswoman said: ?At 08.30 on Tuesday 22 June 2010 a police officer stopped and searched a man under Section 43 of the Terrorism Act in Trafalgar Square. ?No offences were apparent and no further action was taken.? The spokeswoman, who did not name the man questioned, added: ?We encourage officers and the public to be vigilant against terrorism. ‘However, we recognise the importance not only of protecting the public but also promoting the freedom of the public and the media to take and publish photographs. ?Although taking photos in itself is not an issue, if an officer witnesses what they deem to be suspicious behaviour then they are justified in carrying out a stop.? In January thousands of amateur and professional photographers packed Trafalgar Square in protest about heavy-handed treatment by police officers under anti-terrorism laws. Earlier today we reported that the Met has promised to launch an investigation after its officers prevented a photographer taking pictures of police cadets in Romford, Essex last weekend.